I know there are many types of squares, and ultimately all of them are used check an angle for square-ness, i.e., to make sure it is a 90° angle. But different squares are good at different jobs. For example, a Swanson speed square has a lip on one side that makes it really good for quickly drawing a perpendicular line on a work piece (among many other things). Most sources from around the web just say that "try square" is another name for "square", and describe what a square does. But I'm thinking there must be something that a square with one arm thinner than the other is better at than, say, a Swanson square or a framing square. A try square is similar in that respect: the handle is thicker than the blade, so it's easy to push the inside of the handle up against the edge of a board and mark (or verify) a line perpendicular (square) to the edge. And you can easily stand a try square on the outside edge of the handle to check that your table saw blade is at 90° to the table. You can check inside corners with a try square or a speed square, but due to its triangular shape a speed square can't be used to check outside corners the way a try square can. A speed square is a rugged, rough tool that is built to be tossed in a bucket of tools and which you can always count on to get you close enough to square for construction purposes. A try square is less rugged and should be treated more like a precision instrument — take care not to drop it, give it a safe home in your toolbox, etc. When discussing tools, there is a spectrum ranging from construction tools (good enough for framing a house but not necessarily precision instruments) to machinist tools (which are typically highly precise). Woodworking tools fall somewhere in between. 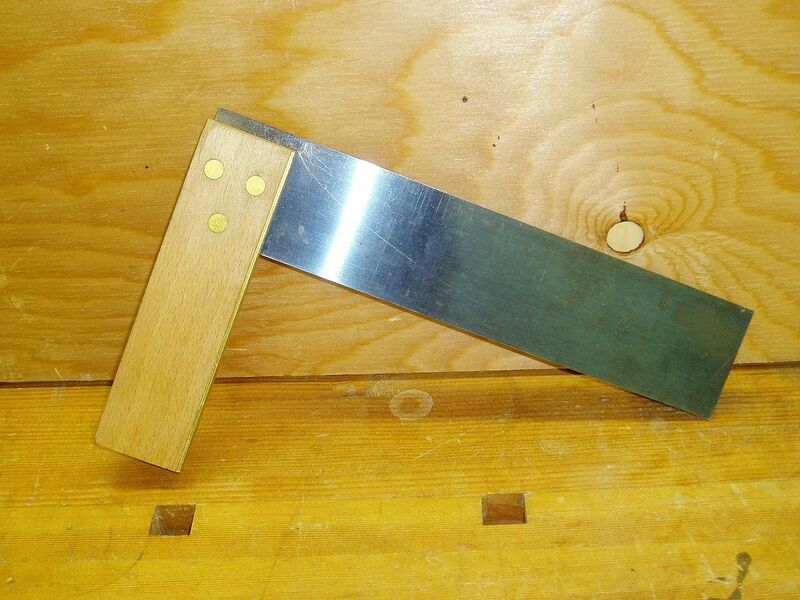 A try square like the one pictured in your question is great for scribing or drawing 90 degree lines, but it also can be used for machinery setup and for checking whether an inside or outside angle between two surfaces is exactly 90 degrees. Try squares especially excel at wrapping lines around corners; for example, when laying out joinery with a marking knife or pencil. A combination square can also perform the same duties as a try square. Not the answer you're looking for? Browse other questions tagged tools hand-tools tool-identification or ask your own question. What tool would this handle be for? What kind of a hand saw guide is being used in this video? Are mortises with angled walls cut the same way as square mortises (handtools)?